Impressive development projects and equally lofty goals are typical of the innovation centers and districts a number of universities are pouring money into as a way to create magnets — they hope — for a greater influx of industry partners to their campuses. These projects typically involve large buildings and tens of millions of dollars in cost. Is it worth it, and is that what it takes to attract industry in this era of university-industry collaboration? Major innovation developments being planned at Michigan State University and the University of Georgia are two examples of these investments, and those involved see them as imperatives, at least in their markets and in their circumstances. Michigan State, which opened the Grand Rapids Research Center in 2017 with the goal of pursuing new treatments for cancer, Alzheimer’s and Parkinson’s, now plans a second building to help realize the vision of Norman J. Beauchamp Jr., MD, MHS, dean of the MSU College of Human Medicine. Health Innovation Partners, a joint venture between Rockford Construction, a local firm, and two Chicago companies, will be breaking ground on a building that could be between seven and nine stories high with as much as 250,000 square feet, significantly larger than the original research building. There are also tentative plans for a third building. Beauchamp says there is a direct connection between attracting industry partners and improved health for patients, and he also maintains that scale is a major factor in encouraging the kind of ecosystem development needed to pique those partners’ interest. The bottom line, Beauchamp maintains, is that bringing partners to the table ultimately brings better health to patents. “At its core, it’s how do you bring health and healing to people faster?” Beauchamp challenges. “If you want to get that care to patients you have to have partners who understand how to go from discovery to product, and that is one of the bigger reasons we pursued this.” The pieces just below the surface mission, he adds, include licensing, patenting, commercialization, manufacturing and distribution. While the building begins in Michigan, meanwhile in Athens, GA, an entire ecosystem is taking shape. A task force assembled by University of Georgia President Jere Morehead to do a feasibility study has identified eight parcels of land totaling about 12 acres in the downtown area as the heart of the school’s Innovation District Initiative. A master plan is currently being developed, with a major focus on attracting industry players for long-term partnerships. The district is part of Morehead’s vision for a “campus of the future” that’s a hub for start-ups and research commercialization. “At the broadest level, UGA wants the Innovation District Initiative to become a more powerful driver of innovation and the ecosystem,” says W. Kyle Tschepikow, PhD, special assistant to the president and director for strategy and innovation at the University of Georgia. 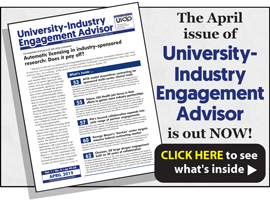 An in-depth article on the large-scale projects under way at UGA and MSU appears in the March issue of University-Industry Engagement Advisor. For details on subscribing, CLICK HERE.